Throughout her life, Nora Ephron was the ultimate multi-hyphenate, succeeding as a journalist, a film director and a writer of fiction, essays and plays for the stage and screen. With those efforts, Ephron, who died at 71 on June 26, has left behind a groundbreaking legacy filled with great characters, plenty of wit, and that distinct Ephron perspective. Her outlook was so particular that they came to form a particular category: the "Nora Ephron film." That category, writes the San Francisco Chronicle, "promised a movie containing some specific elements: At least one strong woman's role ... barbed humor ... bone-deep romanticism ... and just a hint, sometimes more than a hint, of nostalgia." You can see those characteristics in her screenplay for 1989's "When Harry Met Sally." While the word "classic" gets tossed around a lot when referring to (somewhat) older films, in the case of this oft-quoted romantic comedy, it holds true. "Classic" is a fitting description, writer/director Nicholas Stoller told the Huffington Post, because Billy Crystal's Harry and Meg Ryan's Sally are actually "two pretty messed-up characters. They're pretty flawed ... it goes to a dark, pretty real place between them. That's why it's a classic. Nora Ephron does not pull her punches in that movie." She carried that same voice into her work on the page, crafting both fiction and non-fiction. Her essays in 2006's best-seller "I Feel Bad About My Neck: And Other Reflections on Being a Woman" culminated into a "wry and invaluable book about aging," the New York Times writes, pointing out the essay "On Maintenance" in particular. Throughout her career, the Times says, Ephron "perfected a wise and winningly nit-picky persona, turning herself into every reader's confidante." Indeed, when New Yorker writer Ariel Levy picked up Ephron's novel "Heartburn" while traveling, she found a companion in Ephron's "funny, frank, self-effacing but never self-pitying and utterly intimate" voice. That voice was brought to the big screen with 1986's "Heartburn," the screenplay for which Ephron adapted from her novel. "Ephron ... was an artist of consolation, on the page and in her movies," Levy writes, positing that part of the reason you can always watch "a Nora Ephron film" is because they're not only funny, but also "profoundly reassuring." Audiences ate that up, with her directorial work - including "Sleepless in Seattle" (1993); "You've Got Mail" (1998); and "Julie & Julia" (2009), all of which she also wrote - grossing a cumulative $515 million domestically, according to BoxOfficeMojo.com. But her greatest work also includes the lessons she left us, her audience, with, and those she imparted by example to women who aspired to her greatness. Commented actress and screenwriter Nia Vardalos on the evening of her passing, "Nora Ephron you helped all writer-girls know to just tell the truth." On the eve of her death, a quote of Ephron's echoed from the mourning: "Above all, be the heroine of your life, not the victim." Excellent goods from you, man. I have keep in mind your stuff prior to and you are just extremely magnificent. I actually like what you've got right here, really like what you are saying and the way in which you are saying it. You're making it enjoyable and you continue to care for to keep it sensible. I cant wait to learn far more from you. This is actually a terrific web site. Watching When Harry Met Sally in my early 20's made me realize that relationships need friendship and work. That movie helped me outgrow the extended adolescence of a GenXer )(and the lame romances that resulted), I"m fairly certain. There weren't a lot of options in the 80's – 90's for telling the love stories of ordinary women (Pretty Woman? ah, no) – Heartburn was another "wow" moment and the grown-up world not for the faint of heart. RIP Nora. . . The internet seems to bring out the worst in some people. Nora is most famous for coining the phrase "zipless fu(k" for women who go after the one-time fling. Look it up. I did, and it appears that Erica Jong did that, not Nora Ephron. I stand corrected. Good job. Are you sure that wasn't that wasn't Erica Jong in Fear of Flying? So absurd. YOU may not remember her films by the end of your lifetime, and your poor kids seem destined to follow in your tracks, but When Harry Met Sally is a classic that will be remembered by many of us more observant and intelligent folk until our deathbeds. "You made a woman meow?" Sorry for your loss. such nice things to say TROLL! Yeah, whatever. I won't be missing her. Well, gee, thanks for telling us. And yet the Palins continue to waste oxygen. Is there no justice? You could always kill yourself if you are so worried about oxygen levels. No one will miss you or your tired, boring, obsessive, pointless posts. Excuse us Observer and palintwit–you are in the wrong SoundOff area. There is a place for politics on this site. We prefer to talk about Nora. So if you will excuse us, take the red/blue-dont -care comments elsewhere! Rest in peace beautiful Nora.. Thank you for such wonderful movies and quotes.. strength and comfort and joy.. Right! She's such a loss. We will miss you Nora! Ill visit your memorial page at Evertalk. I love the quote! I'll live by those words. 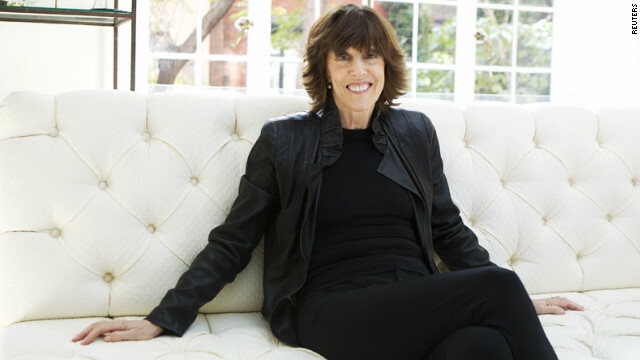 RIP, Nora Ephron. I wonder if there were any films made that are not yet released. Probaly not. I did love her movies. Now I want to spend a day watching them. I haven't seen a bunch in a while. Julie and Julia is probaly my favorite.